BUDGET ADVOCATES-Neighborhood Council Budget Advocates (BAs) met for Regional Budget Day on Saturday, January 20, at the LA Zoo’s Witherbee Auditorium. Budget Advocates: City Council Must Earmark Some Cannabis Income for Community Benefit! BUDGET ADVOCATES-As a City Budget Advocate, I volunteered to chair the Cannabis Committee for this year’s White Paper which will be submitted to the Mayor early next year. With cannabis being the newest department to generate revenue to the city’s General Fund budget, our committee’s first goal was to meet with the newly hired Executive Director, Cat Packer and ask, how do we keep track of the money? The advantage of being a new line item in the budget is that there is no haze of the past, no inconsistencies on the “whys and hows” of the department’s budget. It’s a fresh start to transparency, which is the primary goal of the Budget Advocates representing 97 neighborhood councils. ADVOCATING FOR YOU-Los Angeles is a city of many neighborhoods, 97, if you consider the number of neighborhood councils currently working to make the Mayor’s office and City Council more responsive to local needs. Each neighborhood faces unique issues but there are also problems shared by just about every resident in this city. The city is expansive, from downtown to Gardena, from Hollywood to the Valley. Neighborhood Council Budget Advocates: What Do They Do? ADVOCATING FOR YOU-Nothing runs without money. No trash pickup, no street cleaning, no public services. One important function of the 97 Neighborhood Councils is contributing to a priority list of neighborhood needs that will be presented to the Mayor as part of the City’s yearly Budget preparation. Want Transparency in City Finances? Vote Now on ‘LawMaker.io Challenge’! BUDGET ADVOCATES-In nearly every public address they give, our City Councilmembers and Mayor mention how far our City has come in providing Angelenos an efficient and transparent government. LA WATCHDOG-The Neighborhood Council Budget Advocates, elected by the Budget Representatives from the 97 charter-authorized Neighborhood Councils, believe that the Mayor and the City Council have failed to address the long term financial issues facing our City. At the same time, the City is resorting to financial gimmickry to eliminate next year’s projected $270 million budget gap. NC BUDGET ADVOCATES-The City faces numerous challenges, many due to the crumbling infrastructure, as well as increases in liability claim expenditures related to Transportation and LAPD. These challenges were addressed at the meeting between Budget Advocates and City Attorney staff members. NC BUDGET ADVOCATES-The Budget Advocates met November 18 to address numerous issues pertinent to their roles as advisors to the Mayor and Mayor’s Office, as well as being a liaison regarding budget and city services between the Neighborhood Councils and the Mayor’s Office and city departments. NC BUDGET ADVOCATES—LA Neighborood Council Budget Advocates Janet Kim, Carol Newman, Michael Menjivar, and Ricardo Ramirez met with Chief of Staff Leela Ann Kapur and Budget Director Michiko Reyes from the City Attorney’s office to share recommendations, challenges, and successes concerning the city’s liability issue and lawsuits. ADVOCATING FOR YOU-Los Angeles is home to the largest, most diverse system of grassroots governance in the world, the LA Neighborhood Council System. Except, in our city of 4 million people less than 1% of us know what a Neighborhood Council (NC) is or the amount of influence they hold. I've lived in LA for roughly a decade and had never learned any of this until this past spring. So, being brand new to the NC system myself, I was interested in learning more. What better place to make a real difference than in my own neighborhood, right? City Services are Slackin' … But Who's Got the Time? We Do! NEIGHBORHOOD POLITICS--Grievance panels and election challenge panels are one and the same. And they don't work. In 2 different election/referendums, the appointed panelists were over ruled by the general manager of the Department of Neighborhood Empowerment (DONE). NEIGHBORHOOD POLITICS--Last week at the Board of Neighborhood Commissioners meeting, a startling new policy was allowed in the new Hermon Neighborhood Council Bylaws. Make your Voice Heard! Get Involved! NC BUDGET ADVOCATES--After the releases of the City o Los Angeles Budget Summery on April 20, 2017, we went out into the community to get their perspective on the city's Budget Proposal. But after speaking with several Angelenos, who had a lot say but did not know where to take their concerns I spoke to Gloria Gonzalez a senior resident of the Eastside of Los Angeles. We asked Gloria, What are your thoughts on the Mayor's third proposed Budget? "I see the city of Los Angeles make promises to help the residents and increase services in someway year after year but nothing ever gets done and we hear the excuses about lack of funding, etc. I have been a resident of Los Angeles for over 50 years and I have never seen the city in such a state of disarray. The homelessness situation is out of control and waiting in line at any grocery and/or retail store takes hours. The infrastructure of Los Angeles is just deteriorating and I wish the Mayor and City official would do more to increase the value of our city. Los Angeles is starting to look like a 3rd world country, I can't walk down the street without someone asking me for change, someone living on the street or a rogue street vendor trying to sell me something. Every year the Budget Summary mentions something about addressing these issues but nothing is ever done about it." Q: So what can the Budget Advocates do to make sure these issues are addressed? Whether it's the Budget Advocates or anyone else, someone needs to hold the city responsible for the current state of Los Angeles. Regardless of what is going on behind closed doors in meetings, on boards etc. The city just looks bad and somebody needs to be held accountable. I told Gloria to take her concerns to the city council meetings and her local neighborhood council meetings. 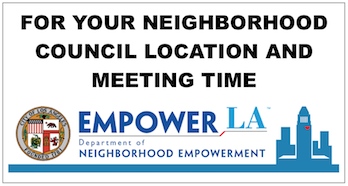 Go to EmpowerLA to find out when neighborhood councils meet, go to LA City to see a calendar of public meetings where you can voice your concerns. Be up to date on what's going on in LA … especially your community … and get your questions answered. Also check out your the Neighborhood Council Budget Advocate meetings twice a month, the first Monday of the month at 7 PM in City Hall and the third Saturday of the month at 10 a.m. to discuss the City's Budget and the City’s finances. Make your voice heard! Get Involved! It’s why Neighborhood Councils were created and made a part of the City Charter. LA Budget Season is Open! Create an independent “Office of Transparency and Accountability” to analyze and report on the City’s budget, evaluate new legislation, examine existing issues and service standards, and increase accountability. Adopt a “Truth in Budgeting” ordinance that requires the City develop a three-year budget and a three-year baseline budget with the goal to understand the longer-term consequences of its policies and legislation. Be honest about the cost of future promises by adopting a discount rate and pension earnings assumptions similar to those used by Warren Buffett. Establish a “Commission for Retirement Security” to review the City's retirement obligations in order to promote an accurate understanding of the facts. Then In November, the city of Los Angeles departments submitted their budget requests to the Mayor and the City Administrative Officer (“CAO”) as well. On March 1, Los Angeles City Controller Ron Galperin released the City's annual revenue forecast. The Controller’s report highlighted increases in City revenues that fail to keep up with increases in City spending and the need to exercise caution in new spending both for the current fiscal year and for the Mayor's soon-to-be proposed budget for 2017-18. A week later, the Neighborhood Council Budget Advocates met with Mayor Garcetti to present the White Paper, "Back to Basics". The 88 page white paper was submitted to the Mayor and other city officials with several recommendations for the upcoming fiscal year. On April 20, the Mayor released his Proposed Budget to the City Council. The Mayors Budget highlighted Key investments in the FY16-17 proposed budget supporting the Mayor’s long-term budget priorities of A safe city: By Strengthening our public safety workforce, PROSPEROUS CITY: By addressing the homeless crisis and quality housing at all levels, A LIVABLE AND SUSTAINABLE CITY: Restoring the condition of the public realm and the quality of our environment, A WELL-RUN CITY: Building a customer-focused City workforce and upgrading technology. Now it's crunch time, the Budget and Finance committee will begin meeting to consider the Mayor’s budget on Wednesday. Within two weeks, the Adopted Budget is approved by the Mayor and the City Council and July 1, 2017 is the beginning of the new fiscal year. BUDGET ADVOCATES--On Thursday April 20, at 10 a.m., Mayor Garcetti will present the 2017-18 budget at City Hall. Whether you live in East Los Angeles, South Los Angeles, San Fernando Valley or West Los Angeles, we can no longer afford to live in a bubble. The budget will change how the city operates and you should be there to hear the specifics. You work. Some city services may have to be trimmed to balance the budget and your organization may be impacted and have to lay people off. Neighborhood safety is a concern. Your neighborhood has had an increase in crime because of lack police patrol and you were placed on hold when you called 911. There are officers, but they are on desk duty. You own property or rent. Property taxes will increase and rental rates now consume more than 40% of a person’s paycheck in most cities. You feel nothing will change: Things always change. For some neighborhoods the change is positive and for others the change can have a negative impact. You don’t trust the system. Some city relationships have been an obvious conflict of interest, while others were cemented before the public was made aware of them. Attend and ask for the transparency needed that will help you support the mayor’s city initiatives and budget. Math isn’t your thing. If you have ever purchased something, prepared a cooked meal, received a paycheck, paid bills or voted, you are better at math than you give yourself credit for. In most cases we can all recognize when a number is too big or too small. 50-million in lawsuit settlements. Mayor Garcetti’s budget is said to account for critical services, street repair, and homelessness. Attend and hear for yourself how the budget will be balanced. The great thing about our government is that you can participate in various ways. Remember you can write or email your local council person about neighborhood concerns and join your neighborhood council as a budget representative or budget advocate this coming June. On Thursday, April 20 the 2017-18 proposed city budget will be posted at http://cao.lacity.org/budget/index.htm, but you can view past budgets now. To learn more about the roles of budget representative and budget advocate visit http://ncbala.com/responsibilities/. NC BUDGET ADVOCATES--The city of Los Angeles allows developers to build without adequate parking spaces per unit then tickets vehicles for parking in desperation anywhere they can. It’s a catch 22 and adding to the misery, fines keep increasing each year. The city of Los Angeles is causing the parking problem so why are they charging (ticketing) us? Excessive on-street parking is a major issue in Los Angeles. A parking ticket fine in LA on average is $68 but parking is non-existent. So the people of this city are sitting ducks who are quickly fined before they can even put their vehicle in park. If the city keeps going at this rate Los Angeles will be a walking only city. According to www.parking.controlpanel.la … a website introduced by the LA Controllers office … the Los Angeles Department of Transportation Citation Program generated close to $148 million in gross ticket revenues in Fiscal Year 2015-16, but some 3⁄4 of ticket revenue went to overhead, salaries and administrative costs. The remaining $41 million was available through the General Fund and used to pay for City services such as police and fire. This website also indicates that "the City of Los Angeles also has a responsibility to make sure parking tickets are fair and reasonable". If this is the case, why does the city allow developers to continue to build multi-unit dwellings without sufficient parking? Currently Los Angeles drivers who receive tickets for parking violations have a better chance of getting relief because of the 2016 Weiss v. Los Angeles case (Court of Appeal, State of California, 8/8/2016) in which the California Supreme Court ruled that Los Angeles will have to handle parking ticket appeals rather than contracting them out to a for-profit company. The issue with Los Angeles did not stop there, around January 2017 budget Advocate Brigitte Kidd was approached by William Taylor a Military Veteran who received a $490.00 traffic citation in the mail and he told her he needed assistance fighting a citation he received on August 7, 2016 at 8:54 am. The citation stated that he did not stop for a railroad crossing going westbound on Century Blvd at Grandee Avenue. The letter also instructed Mr. Taylor to respond to Los Angeles Superior Court by September 26, 2016. Mr. Taylor immediately responded claiming that “the timing of the traffic light to the crossing arms and camera has been out of sequence for over three months. Crews have even worked on Sundays to correct the timing issue”. Mr. Taylor claims he did nothing wrong and did not understand why he received a ticket. Mr. Taylor appealed the ticket and went to court on November 17, 2016, where he plead not guilty. In court the Judge had Mr. Taylor plea to lesser fine of $285.00 but she did not dismiss the ticket. In response, Mr. Taylor still declaring his innocence, decided to file a civil lawsuit against Metro Transportation Authority and Los Angeles County to get his money back for the traffic infraction. After further investigation Mr. Taylor found out the money paid to Los Angeles Superior Court was divided between at least 20 different entities with the last dollar going to Xerox Corporation and that if he wanted to sue he would have to bring all of them to court. After finding out this information Mr. Taylor requested a list of the 20 different entities and was denied this information by a MTA representative. After being denied access to this pertinent information, Mr. Taylor filed a complaint with MTA and reached out to several city officials who could not answer any of his questions. After not receiving a timely response from MTA, Mr. Taylor went to the next MTA board of directors meeting where he spoke during the public comment time and there he was instructed to meet with a MTA representative in the hallway that could further assist him with this matter. In the hallway the MTA representative took down Mr. Taylor’s information and instructed him to file a claim for damages if he wanted to receive a refund. Mr. Taylor agreed but did not understand why he had to file a damage claim instead of MTA just reversing his ticket and giving him his money back. Even after receiving a refund Mr. Taylor is still not satisfied because none of his questions about where his $490.00 traffic infraction money went were ever clearly answered. Since this incident the city has started making repairs to the light and has also decided to put Eastbound cameras at the Century/Grandee intersection as well and after the local CBS news picked up the Taylor story in February 2017, the city has decided to refund every driver who received a ticket at that intersection a refund but we still have questions. Why is a for-profit company still handling Los Angeles city traffic violations after the State Supreme Court ruling? BUDGET ADVOCATES--The Budget Advocates of Los Angeles have been in existence for 13 years … a group of citizens dedicated to the people of Los Angeles and watchdogging the city's budget. The Neighborhood Council Budget Advocates know the City Budget is the one issue that touches every person, company, and life in Los Angeles and affects such things as tree trimming, pot hole filling, sidewalk repair, police and fire protection, parks and arts, and all other services provided by the City. Among this group are two legendary budget advocates, Jay Handal and Jack Humphreville.They are also the two longest serving Budget Advocates. Both have been BAs for 6 years. Jay is currently the Co-Chair of the Budget Advocates Committee. Jack is currently the Budget Advocate for Region 5 …Central Los Angeles. Q: What made you want to get involved with NC Budget Advocates? Jay Handal: As someone interested in budgets, it was apparent to me that the City was not being good stewards of our money. I wanted to be able to dig in and change the direction of the existing Budget Advocates so that we were not just reporting on how to spend each portion of a dollar, by department, but rather to looking at efficiencies, waste, fraud, abuse and long term forecasting. Jack Humphreville: City’s finances were a mess. City Hall was misleading us. Concern about policies that neglect our streets and infrastructure. Diverting funds to the personnel. Inefficient operations. Felt that I could make a difference. Q: What are some of the changes the budget advocates have influenced? Jay Handal: By far the biggest change was the formation and hiring of the Revenue Inspector General. In his first year he found more than $43 million due the city. Our second biggest accomplishment was getting the City Council to recognize our work and to formally give us a seat at the table to present and have our recommendations analyzed. Jack Humphreville: Ask Jay. He has a better handle on it. But the major change is that City Hall knows we are there and they have become more open and transparent, in large part because of Miguel Santana. Q: What can people in the community do to get more involved and be more supportive of the budget advocates? Jay Handal: Stakeholders should read our report and comment to us. Stakeholders will see how money is actually being spent and how very limited dollars may be reapportioned in order to bring more services to them. Stakeholders should contact their council members and demand that recommendations for change be accepted and enacted. Jack Humphreville: People need to tell their representatives that the City’s finances are unacceptable.